Spending the better part of a day preparing a lavish dinner for friends is a meditative and restorative activity for me. But at 8:30 on a Tuesday night, I just want to get something tasty and nutritious into my stomach as quickly as possible. 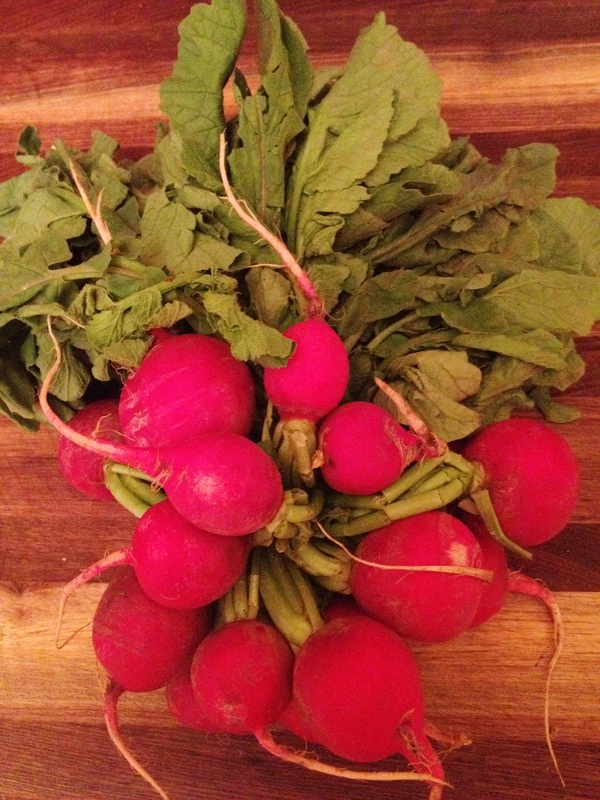 I opened the fridge to discover that the greens atop these radishes were beginning to wilt. 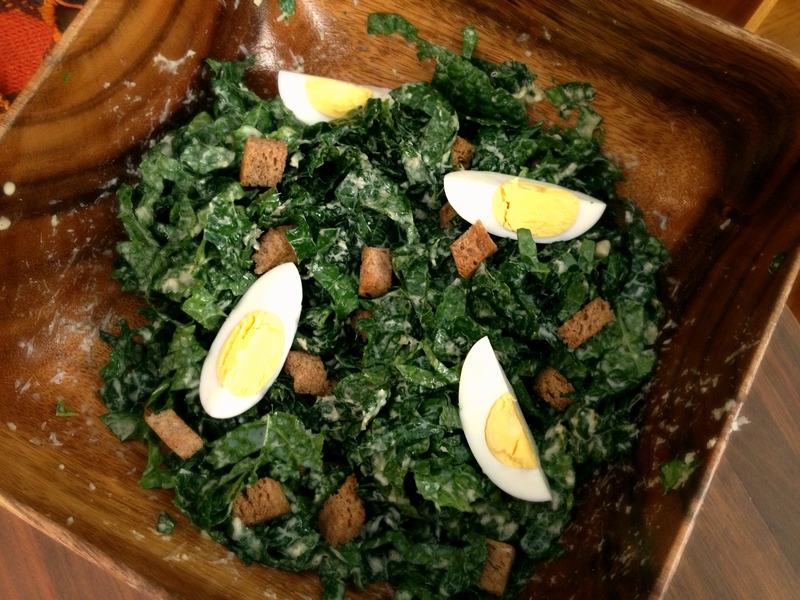 If you haven’t caught on by now, I am a bit obsessed with dark leafy greens. Last summer, unable to bear the thought of throwing out such a bounty of greenery (and after having Googled to ensure that they were not poisonous), I decided to try eating the radish greens. They’ve got a slightly rough texture and a bitter, peppery flavor similar to the radish itself, but much more subtle. That is to say, they are delicious. Tonight I prepared the radishes and radish greens alla puttanesca, which translates as “whore’s style.” There are a number of variations on this, but they all include a variety of savory ingredients–including tomatoes, garlic, onions, chiles, anchovies, capers and olives. Note that these are ingredients that keep well in the pantry or fridge, ready to deliver a burst of flavor whenever you need it. For this dish, I added a couple of anchovy filets, a tablespoon of olive oil, half a tablespoon of butter (to promote browning), one thinly sliced garlic scape (regular garlic would have been fine, but it’s what I had), and a big pinch of red pepper flakes to a cast iron skillet over medium heat. After a few minutes of stirring, I had a nicely seasoned browned butter. 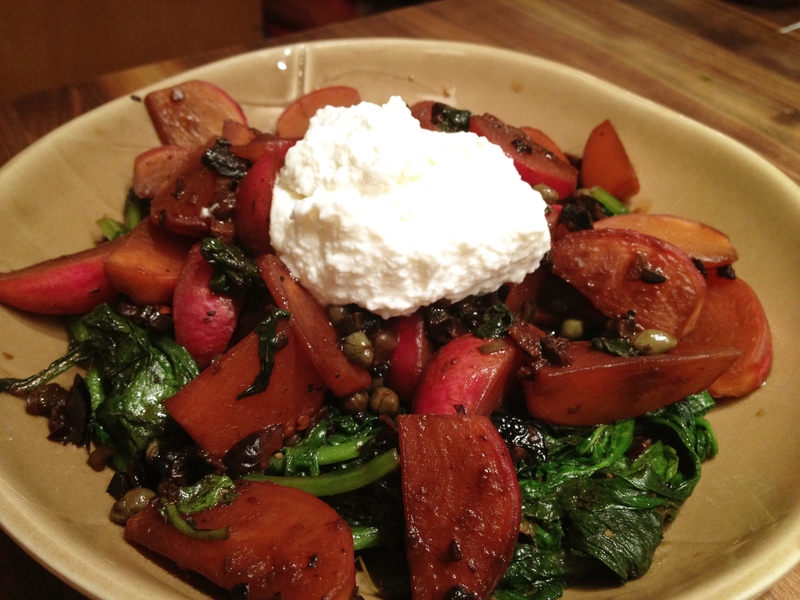 In went the radishes, cut into wedges. I was getting some nice color on them, but they weren’t cooking as quickly as I had hoped, so I added some water to help them along. When the water was nearly gone, I added the radish greens (which you want to wash a little more thoroughly than I did, as they tend toward gritty) and sautéed them. At the last moment, I threw in a tablespoon of capers and 10 or so oil-cured olives that I had chopped and pitted. I finished the dish with some ricotta cheese for a little protein. This would be awesome with some whole wheat pasta.